Something interesting always happens but you might hardly notice it hidden in the wealth of already existing features. New option added to ‘Settings’: “Control | Miscellaneous | Board dimensions: Show floor count” with default value “No”. Actually this switches floor count on/off in the “Open Level” Window(See below in the lower left corner). Discovering that (with a little help) I also discovered a neat existing feature: Go to Control | Windows | Main Window and you can switch collection title and floor count on/off in the title line. 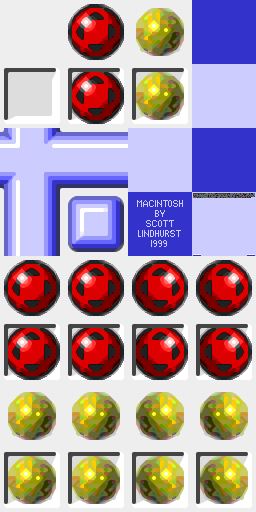 An adaptation of the “MacIntosh” skin from Scott Lindhurst’s “Sokoban for the MacIntosh” has been added to the common skins provided with YASC. The original skin has been electronically scaled up by a factor 4 and undergone a lot of manual editing with surprisingly good results: Y-Sokoban also uses the common skin format so users of this program can enjoy the skin too. “Show a grid on top of a skin”. Some skins make it difficult to distinguish the individual floor squares on the board. Now it is programmatically possible to draw a grid on top of the skin. The grid options can be found in ‘Settings’ under “Graphics | Board | Grid”. Appropriate images are required. Below “MacIntosh” without grid on the left and with grid on the right. 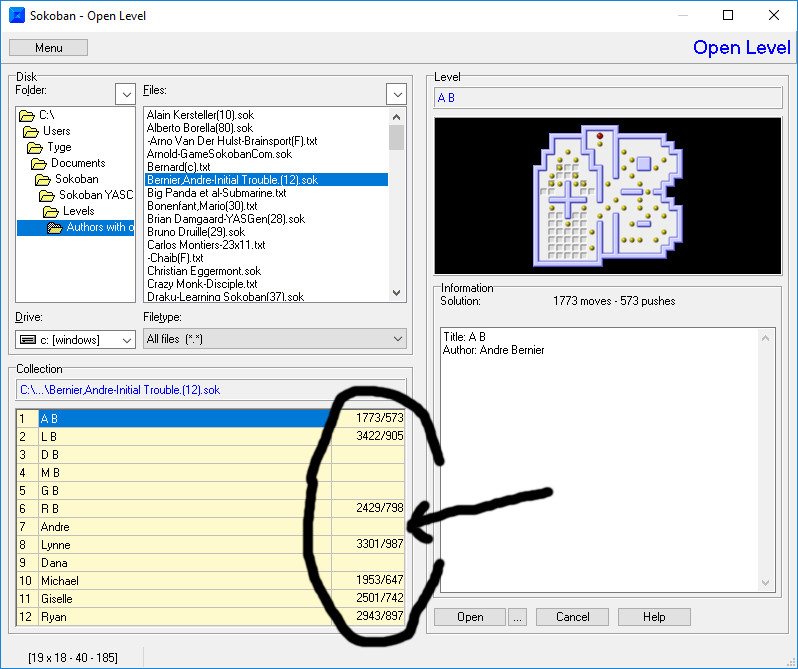 In the “Open Level” window you now find an useful extra column showing records for solved levels and making it easy to find unsolved levels. New feature? No. the default value for the option “Show solutions?” has just been changed from “No” to “Yes”. Read about more new features in the release notes. You will find them in YASC at “Settings”>”Help”>”Release notes”.